Not much was known about what was expected at the Katara Foodie Zone until QIFF 2016 was officially opened. We visited with open minds and were pleasantly surprised. Having spent way too much time at the three QIFF venues we have had a good look around and can give you our first impressions. It is smaller than expected considering the size of the Promenade, however Katara does have other events on. Despite it’s size it has a complete look that works rather well. There is a live cooking theatre with trained chefs cooking interesting dishes from different food cultures. Unlike the main MIA Park food festival hub at Katara there isn’t much to do for children,however there are some stage shows. A large range of the Aspire Katara Hospitality restaurants have a presence at the foodie zone. So for those of you haven’t given them a go because of uncertainty now is your chance to try their flavours out. We have a sneaky suspicion that AKH is subsidising the foodie zone as the prices are amazingly reasonable compared to the hotel and restaurant offerings at MIA Park! It hasn’t been that busy which is a crying shame – there are some great value-for-money dishes, that have great flavours and taste rather good. Most main dishes are priced at QR20. See the menus below! We expect it to be more busy at the weekend, so please be smart about your travel arrangements. Also please tidy up after yourself – let’s not leave discarded rubbish behind! 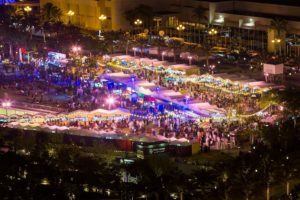 UPDATE: Check out our feature on Pearl Qatar Beach Pop Up QIFF 2016 It will help you plan your way around Qatar International Food Festival. You will find Menus with pricings, and our rather surprising first impressions! We tried a range of dishes and the standouts were: Murgh Boti Roll (Saffron Lounge); Lamb Tandir on Burgur Pilaf (Sukar Pasha), and the Mongolian Barbecue (L’Wzaar). The particular thing to note about these dishes is that they may not necessarily be on the restaurant menus. However the flavours and seasonings are representative of their individual cuisines. 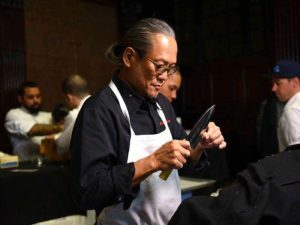 We would repeatedly go back for the first two…and if Chef Brian Lumley’s Ackee Spring Rolls were sold at the Festival we would have to be rolled away at the end of the night…! 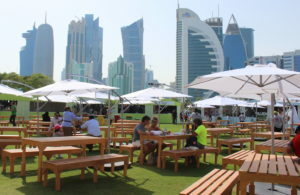 Want to see what else is going on then scroll down for our pictures from Katara’s Foodie Zone! This year’s Festival will have a presence in Katara Cultural Village, with a cooking theatre and an entertainment zone planned in the Village’s beach area. 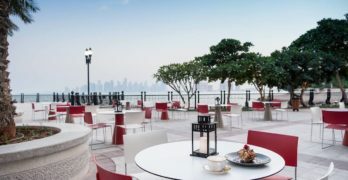 Foodie Court – expect a range of restaurants to serve up culinary delights for every palate along the Katara promenade. Live Cooking – This includes dishes as varied as pomelo salad, beef wellington, jamaican jerk chicken and ackee saltfish. Visitors will also be taught how to make the popular regional dessert Kunafa! Entertainments – includes DJ, Nils Nily (the unicylist), and Barbs. Check out the QIFF 2016 – Schedule of Cooking Theatre & Entertainment for more details. The water shuttle service from MIA Park to Katara or The Pearl-Qatar will be ticketed at QR25, and will run every half hour. Arrangements have been made for a free bus service at 1 La Croisette The Pearl-Qatar from where water-shuttle users can take a bus to Qanat Quartier. Water Taxis have limited seating and are available on a first-come-first-served basis. Water taxi services will stop during the daily fireworks display at 8:30 pm for safety reasons. Frequency: Every half hour. First boat departs 4:00 pm, last boat departs 9:15pm. Please note that water taxis will dock at La Croisette. A free shuttle bus will be available to transport visitors to the Festival venue in Qanat Quartier. Frequency: Every half hour. First boat departs 4:00pm, last boat departs 9:15pm. Private Car services and Limo Services are also available.